Salvation And Survival: Venom Within The Church: They Should Be Ashamed! Venom Within The Church: They Should Be Ashamed! 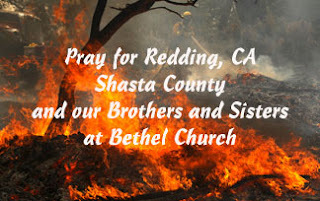 The news of the wildfires in California are capturing headlines across the internet and news outlets, and the conflagration known as the Carr Wildfire has devastated northern California, targeting the town of Redding, where Bethel Church is located. If you are not familiar with Bethel and the Lead Pastor, Bill Johnson, I think it is safe to say that mainstream and religious Christianity do not quite welcome them into the Family of God with open arms. Those who do not believe that the signs and wonders, and the miracle healings that accompanied the First Century Church are for today do not subscribe to the belief system that defines Bethel Church. There is something about proclaiming the promises of Jesus [that those who believe in Him will do the same things He did and even greater] that does not set well with the Pharisees of today. You see, Bethel believes in the full healing properties of Jesus's ministry. They believe that when we receive the promise that "by His stripes we are healed", it is in the full sense of that word healed; namely, we are saved, delivered, healed, rescued, and made whole. And they aren't afraid to walk out what Jesus modeled for us, or to obey Jesus's commission to His disciples: to heal the sick, cast out demons, cleanse the lepers (the spiritually and physically unclean), and raise the dead; all-the-while sharing the good news that Jesus has brought heaven's power to earth. But just as in Jesus's day, the hyper-religious are threatened by this freedom and power to walk as Jesus walked. I have become increasingly saddened -- and yes, even alarmed -- at the vitriol and hatred that comes from the Pulpit & Pen crowd. And, in case you are unfamiliar with them, according to the definition on their own website, Pulpit and Pen (heretofore, to be referred to as P&P) are "Baptists, [who] most – but not all – hold to the five points of Calvinism. All contributors hold other similar convictions, including a belief in the Scripture’s inerrancy, young-Earth creationism, Biblical manhood and womanhood, and a general detestation of skinny jeans". Right off the bat, you get a taste of their sarcastic judgmentalism. Their campaign against Beth Moore and other evangelists they deem "too liberal" caused me to quit going to their site over a year ago. But when googling information of the Carr Fire and the effects on the town of Redding and Bethel Church, I came across an article that I felt needed to be addressed. The sarcasm -- and I hate to say it -- the downright glee with which this website saw the fire as God's justice due against Bethel Church disturbs me. Is the Body of Christ a family or not? Do our differences in theology and doctrine give us license to gloat over the misfortune of our fellow heirs of salvation? Some of the, frankly, unloving points made in this article were shocking. P&P goes way beyond their usual method of calling Bethel a "charimastic cult", and resorts to such cheap shots as the following: "Bethel’s Facebook page asks for prayer to save Redding. In it, the group acknowledges that God is sovereign and in control over the rain and the weather (this seems to contradict Johnson’s message that God has surrendered his authority on the Earth to his people). Ironically, Bethel Church has been praying for “the fire” to fall on them for many years, a charismatic expression that is biblically linked to judgment far more than blessings". Sounds like wishful thinking on the staff of Pen & Pulpit to me. 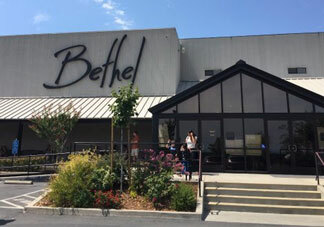 Can they not simply do what Bethel asks, and offer up prayer for the town of Redding, without excoriating the Pastor? First of all, let me say this.... I listened to the snippet of Bill Johnson's sermon on YouTube (available here) from which P&P make their erroneous charge that Johnson declared God had surrendered His authority on Earth to His people. Here's what Johnson actually said: "God has created a system where humanity gets to live, and through partnership we get to demonstrate and manifest the dominion of God in the earth. He comes at our invitation because He has released the dominion to us. That's why prayer is so essential". If you're able to use your discernment, I'm hoping that you realize the difference between "surrendering God's authority" and "releasing the dominion of God". A simple exegesis of those two words reveal that surrender means "give up, yield, relinquish", while release means "make available, put at someone's disposal, set free". Bill Johnson did not say God gave up His authority on Earth to man; but, rather, said God put His government on Earth at the disposal of man through partnership in prayer. That is a different, yet Scripturally valid theology that P&P just can't seem to understand. But when you practice your theology like a Pharisee, then it's easy to make a value judgment against someone else's belief system, based on one’s own assumed secure position. I want to be clear. I do not disagree with everything that the writers at Pulpit & Pen put forth on their website. As fellow Christians and members of the Body of Christ, there is much we agree on.... that there is One True God; a Holy Trinity; Jesus Christ is God, the Living Word, Who became flesh through His miraculous conception by the Holy Spirit and His virgin birth; the death, resurrection and ascension of Christ to sit at the right hand of the throne of God; salvation is received through faith in Jesus Christ as Lord and Savior --- all of which are the foundations of the Christian faith. They are my Brothers and Sisters in Christ, and I will never denounce their faith. I may disagree with aspects of their theology, but I will never question their love of the Lord, nor accuse them of heresy. But I have a problem when one group of Christians appears determined to destroy another; when theological differences become grounds for insults, slander, and outright distortion and misrepresentation. That is exactly what the religious Pharisees did to Jesus. And, interestingly enough, the two main issues they had with Jesus are the same issues the hyper-religious of today have with those who seek to resemble Jesus in their walk: 1) the Pharisees objected to Jesus aligning Himself with God. Today's hyper-religious Christians object to a kind of relationship with the Father that believes that the supernatural God who empowered Jesus desires the same supernatural relationship with us, and 2) the Pharisees objected to Jesus's relationship with men and His willingness to love the unaccepted of society. Today's Pharisees object to our desire to love all men, even sinners who practice what God detests. It does not mean that we approve of their sin, but that through a partnership with God and the Holy Spirit, we can heal them with the love of the Father; physically and spiritually -- just like Jesus did. I actually feel sad for these people who love Jesus, but are unable [and unwilling] to see how much God wants to work with His people to see all men experience His love. I think it is their inability to see Jesus, Holy Spirit and the Father at work in churches and believers like Bethel that keeps them blinded to how big our God is. And when that blindness leads to accusations of blasphemy, heresy, and anti-Christ behavior, then it borders on the denial of God's power in the world today. But the saddest and most egregious aspect of P&P's conduct is their lack of compassion and love for fellow Christians who are hurting. To stoop to mocking and ridiculing Bethel and their Pastor and presenting false accusations that Bethel is only interested in their self-preservation, rather than offering prayer and support to strengthen their Brothers and Sisters in Christ, is not the image of Christ that I seek to model. In fact, no word of support was offered to the Bethel community. The website also offered a link to a satirical article, claiming Bill Johnson accepted full responsibility for the fire because of his theology. That is hate, not love, and I find myself asking, "Is this representative of the state of their "Christian" hearts"? 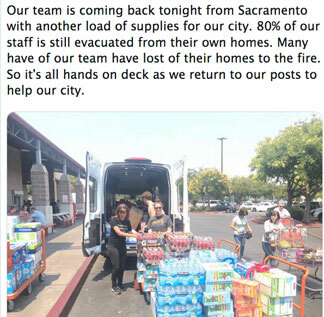 The last line of the article read, "In the meantime, the people of Riverside and Shasta Counties need our prayers and support", followed by tips pointing to Red Cross for evacuation and donation information. Apparently that request for prayer excludes Bethel and their people. But perhaps the height of hypocrisy for this super-religious group of Christians was that the author of the article on Bethel and the Carr fire didn't even have the courage to sign his name. It is written under the authorship of "the News Division". That is cowardly. In summation, I do not expect that my words will count for anything to those who are determined to follow their own reasoning in this matter. And whether you agree or disagree with Bethel Church and its theology, I would hope that, as sons and daughters of a God who loved us so much that He sacrificed His Son for us, we could offer the same grace, mercy and compassion that has been given to us by the same God we all profess to love, follow, and obey. Pulpit & Pen's actions should not be how we treat fellow believers. And oh, how it must grieve our Father. So, forgive them, Father, and I pray for them to receive renewed minds and hearts that reflect You. Let us love one another and not persecute each other. And for God's sake, let us be willing to offer words of comfort and strength in time of need! Amen! Psalm 140:3 They are known for their sharp rhetoric of poisonous, hateful words. Pause in His presence. Thank you for writing this! I was saddened, dismayed, and angry that Pulpit and Pen wrote those scathing words about Bethel. You are right, why do they take it upon themselves to excoriate a man who holds fast to Biblical Christianity? Their differences are not a matter of salvation. They need to leave it alone already! Yes, there is increasingly less unity within the Church, and that cannot please our Lord. We need to pray for the religious spirit to be bound among our fellow Christians.